Kitchens are sometimes called the heart of a home. Whether you love to cook or are a regular at the take-out counter, your kitchen is likely a busy place. It needs a floor that can stand up to foot traffic, spills, stains and still looks nice for those family gatherings that inevitably overflow into the kitchen. It's no wonder that kitchen flooring is one of the most often updated floor projects in a home. When you're ready to update your kitchen floor, give resilient flooring a look. Resilient flooring is a hard surface flooring made from materials that beautifully mimic natural hardwood and stone. As the name implies, resilient floors are able to handle a lot of traffic and bounce back beautifully. From luxury vinyl tile to waterproof composite flooring, there's an option of resilient flooring that's just right for your home. Learn more about resilient flooring. 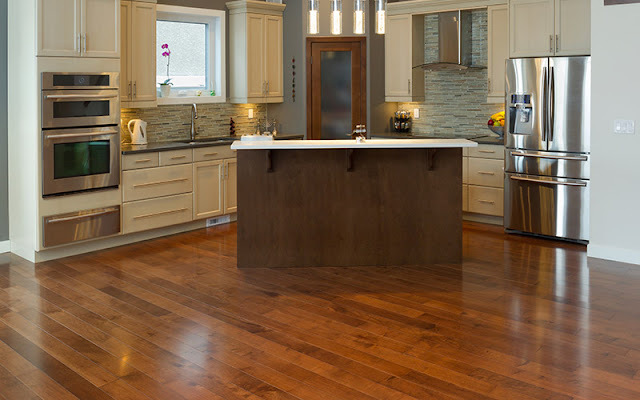 There's no denying that hard surface flooring is a perfect match for kitchens. Hard surface floors are easy to maintain and they are extremely durable - two key characteristics for a good kitchen floor. Resilient flooring is a hard surface floor but it's more comfortable underfoot than stone tile or hardwood. Resilient flooring is made from luxury vinyl or vinyl composite which has a bit of give to it. Simply put, it is more forgiving to your feet and when placed in a room that sees a lot of standing around - that's a big plus. Resilient floors can stand up to everything you dish out... or in this case spill. From the small overturned glass to the accidental pipe break that floods the floor, resilient floors can stand up to the water. In fact, waterproof composite flooring is 100% waterproof. There are no concerns about water damage with these floors. Wondering about stains? Resilient flooring doesn't let stains soak in - you can practically wipe it up and forget about it. Love the look of hardwood but not the impact on your budget? Wish you could have the look of natural slate floors in your kitchen? With resilient floors you can! The manufacturing process for resilient flooring creates a top layer that looks remarkably like natural hardwood, marble, slate or many other types of flooring - more expensive types of flooring. Not just the look, these floors also mimic the texture of these flooring options. It can be hard to tell the difference between resilient floors and the options they are designed to match. Don't just take our word for it. Stop by Kermans Flooring in Indianapolis and ask to see our selection of resilient floors for yourself. You might also consider downloading our free guide to kitchen flooring to make sure you're considering all your options and choosing the best floor for your home and lifestyle.